Ten years ago, when Sandy Malone was planning her Caribbean destination wedding, there was no Pinterest, no Instagram, and no Wedding Wire. The Knot and the Wedding Channel were in their infancy. And Malone was planning her wedding from scratch. The tips and advice in How to Plan Your Own Destination Wedding will help brides and grooms navigate the murky waters of destination-wedding planning-and they are murky because most do-it-yourself brides and grooms are looking to do something "different" from what all of their friends have done before them. Unfortunately, the more remote, bizarre, and challenging the destination is, the more attractive it appears to the do-it-yourself couple. That's where Sandy Malone, star of Wedding Island (TLC), who has been planning weddings for ten years, comes in. She offers advice to brides and grooms on how NOT to spend money on things they don't need to invest in, and where they DO need to spend money to make sure the event runs smoothly. She also gives tips on how to negotiate the contract with the venue, the "wetiquette" of invitations for destination weddings, finding and handling vendors abroad, and much more. 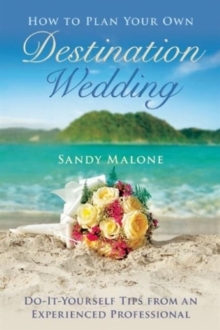 This book offers the complete guide to destination weddings, by a true expert!